alaTest has collected and analyzed 101 reviews of Sanyo Xacti VPC-C6. The average rating for this product is 3.6/5, compared to an average rating of 4.0/5 for other Camcorders for all reviews. People are impressed by the design and price. The size and usability are also mentioned favorably. Many are critical about the zoom and durability. There are some mixed comments about the image quality. We analyzed user and expert ratings, product age and more factors. Compared to other Camcorders the Sanyo Xacti VPC-C6 is awarded an overall alaScore™ of 80/100 = Very good quality. alaTest has collected and analyzed 7 user reviews of Sanyo Xacti VPC-C6 from Amazon.co.uk. The average user rating for this product is 3.3/5, compared to an average user rating of 4.0/5 for other Camcorders on Amazon.co.uk. Reviewers are impressed by the design and portability. The price and size also get good views. There are some critical comments about the reliability and image quality. Reviews are divided on the usability. 71% of the reviews on Amazon.co.uk give this product a positive rating. alaTest has collected and analyzed 53 user reviews of Sanyo Xacti VPC-C6 from Amazon.com. The average user rating for this product is 3.4/5, compared to an average user rating of 3.9/5 for other Camcorders on Amazon.com. Reviewers are impressed by the design and size. The price and usability also get good feedback. The zoom and image quality get mixed opinions, while some have doubts about the durability and reliability. Small and lightweight; rotating LCD screen; digital image stabilizer; quick response for spur-of-the-moment shots; excellent detail in moderately low light. Tripod mounting requires tripod head tilt; manual focus isn't continuous; slow focus in low light. While the Sanyo Xacti VPC-C6 falls well below MiniDV quality, this pocket-size hybrid camcorder can produce acceptable video and stills. Sanyo's Xacti VPC-C6 marries video and still image taking in a small, stylish shell. It's got the looks - does it have the ability to match? How about a tiny shooter that takes JPEGs and MPEG4? A versatile device that's easy to carry around and fast to charge. For its price, this is a very good camcorder. It performs well as a stills camera and its video features, though basic, were surprisingly good. Considering its competition, the fact that it’s Mac compatible is a major bonus point. If you've got a wired network, a bang-up-to-date Intel Viiv computer and a hard disk full of media then this is the device to use to transfer it to your TV. Not only is the Xacti C6 ultra-thin - with a volume of 124 cc and width of 23 mm - it's also ergonomically designed. The handgrip and lenses are angled to enable a natural shooting style. The Xacti C6 comes in a variety of attractive colors designed to suggest a luxurious jewelry motif. What's more, it has a shape and size you can carry around with you every day - just like a tasteful fashion item. The Xacti C6 employs SANYO's newly developed proprietary image-adaptive data processing technology, which enables you to shoot MPEG-4 movies and 6-megapixel stills simultaneously. Movies are recorded clearly, with TV-like picture quality (VGA/30 fps). The Xacti C6 also features a 60 fps playback function for smoother movie playback on your TV screen, along with high-sensitivity technology that enables you to shoot beautiful movies even in dark locations. It all adds up to a significant advance in movie-shooting performance. The Xacti C6 employs a richly detailed 6.37-megapixel CCD (total) and SANYO's proprietary image-adaptive data processing technology. This ensures low noise in dark areas, as well as more beautiful realization of skin colors. The Xacti C6's slim, 23 mm-wide main body comes equipped with a high-powered 5x optical zoom lens. 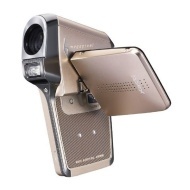 Used in conjunction with the 12x digital zoom, it enables up to 60x zooming capability. Being able to connect the Xacti C6 to a TV, VCR, PC or DVD recorder means you can easily play back recorded images and stills on a large screen, or make back-up copies of your recorded content while you're playing it back. After placing the Xacti C6 in the docking station, you can save recorded video clips and still images onto your computer's hard disk, where they can be edited freely.